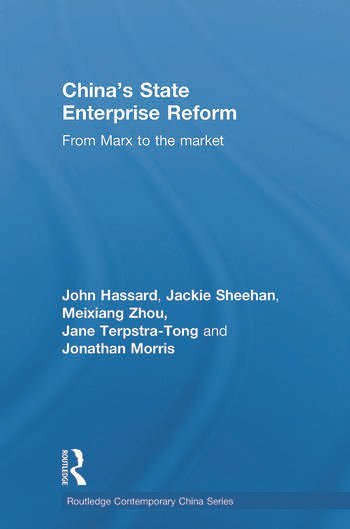 Based on extensive original research, this book provides a comprehensive overview of the current status of state enterprise reform in China. Chinese State Enterprise Reform considers the relationship between public ownership and public enterprises, and the historical evolution of China's economic reform programme since 1978, including assessments of the Contrast Responsiblity System, which operated from the early 1980s to the early 1990s, and the Group Company Experiments, which began in the 1990s. It discusses the relations between workers, managers, and the state in post-Dengist China, the implications of the reform programme for human resources management in state enterprises, the nature of labour representation, and organization under tate capitalism and the problems of surplus labour and reemployment. John Hassard is Professor of Organizational Analysis at Manchester Business School and Senior Research Associate at the Judge Business School, Cambridge University. Jackie Sheehan is Associate Professor of Contemporary Chinese Studies and Deputy Director of the Institute for Contemporary Chinese Studies, University of Nottingham. Meixiang Zhou is Programme Manager of the United Nations Development Programme, China. Jane Terpstra-Tong is Lecturer in Management in the Faulty of Business Administration, University of Macau. Jonathan Morris is Professor of Organizational Analysis at Cardiff University Business School.